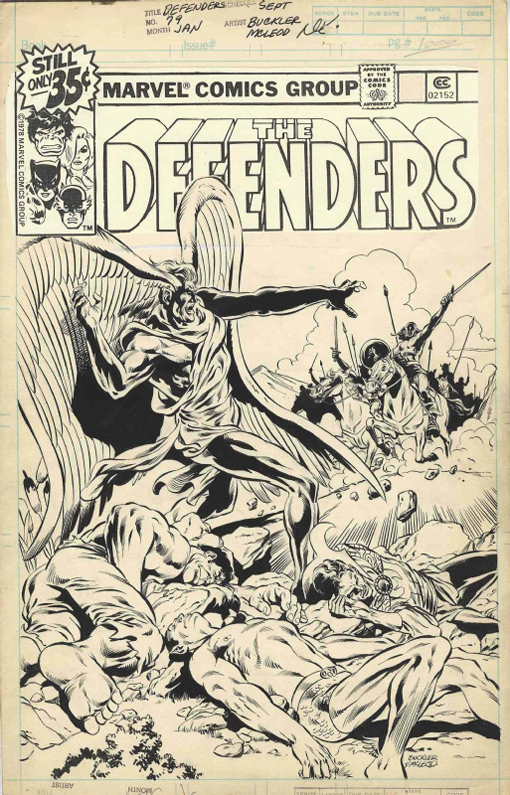 Penciled by Rich Buckler and inked by Bob McLeod, the cover for Defenders #79 shows Dr. Strange, the Hulk and the Sub-Mariner unconscious with the winged Aeroika standing over them and watching the Unnameable approaching with his hordes from afar. I’m willing to bet that if Marvel published this issue today that the cover would highlight the other storyline in this issue with Hellcat, Valkyrie, and Wasp fighting Fem-Force in a full-on cheesecake extravaganza. I’m not complaining about the current status quo, mind you, just pointing out how things have changed since the early 1980s. It's also interesting to note that the original cover art has the Still Only 35 Cents price burst as opposed to the 40 Cents cover price that is shown in the cover scan below. I wonder if Marvel printed any comics with the lower price. Have I just discovered a new variant?